Diecast RegistryTM is the most trusted and most complete source for racing diecast information and diecast collection management tools. Our diecast price guide is recognized as the most accurate diecast price guide available on line or in print. Join over 25,000 other Diecast Registry members to have more fun with the hobby, and to become a smarter collector at the same time. Visit the membership options page to learn more about joining Diecast Registry. It’s free! View the most complete and accurate racing diecast production list to determine exactly which diecast you own, and add those diecast to your Garage. Within your Garage, you can upload photos and add additional information about each diecast in your diecast collection. Additionally, you can now view and track the total value of your diecast collection. Become a smarter diecast collector today! Updated weekly, the DCR diecast price guide is the #1 diecast price guide available online or in print. Learn the in-store retail value of your diecast (commonly called the “book” value), as well as the wholesale (online) value of your diecast. Advanced analytics are also available, including a trend chart to see if the value of a diecast is increasing or decreasing. What is the value of Dale Earnhardt’s autograph? Is Jeff Gordon’s autograph more valuable now that he has retired? How much does the value of a 1:24 diecast increase if the driver signs it? Which NASCAR driver’s autograph is the most valuable? For the first time ever, diecast collectors can find the answers to these questions in the DCR autograph guide. Your FREE bronze membership will allow sellers to post an unlimited number of diecast on our For Sale page. Additionally, the FREE bronze membership allows buyers to shop for and make their next diecast purchase. Best of all, there are no listing fees or commissions to buy or sell diecast on DCR. Buyers are taken directly to the seller’s PayPal account to complete the purchase. 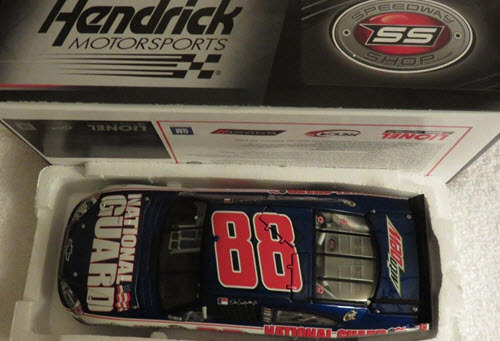 How many Dale Earnhardt Jr diecast have been made? Does Kevin Harvick, Tony Stewart, or Jimmie Johnson have more total diecast made? Which driver is the most popular as determined by the total number of diecast collectors have registered in our database? Which drivers have the most diecast for sale (this “supply” affects the value!)? The personal property component of your homeowner’s insurance will NOT cover your $5,000 diecast collection unless you quantify exactly what pieces are in the collection and are able to provide a third-party assessment of their value, such as from the Diecast Registry online price guide. Register the diecast in your collection today. It’s free!